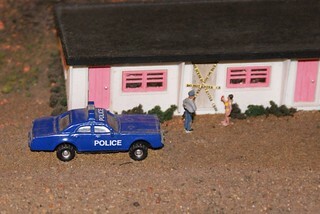 Looks like there's been some sort of crime committed at the fleabag motel at the edge of town. Fortunately, the local police are on it. The woman in the bikini is probably staying at the motel and is bored so she has walked down from her room to see what was going on. This diorama was part of the model train layout they had at the St. Louis Children's Museum. Photographed on January 4th, 2013.